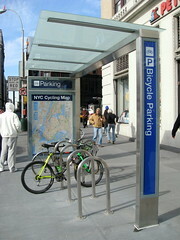 Sheltered bike parking on the street that contains stainless steel bike racks for eight bikes. 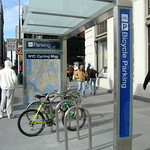 The ad panels will display the annual NYC Cycling Map and safety information for cyclists. The future construction of 36 more Bicycling Parking Structures signals that NYC is embracing cycling as a healthy, environmentally sustainable form of transportation. You can also find U-shaped bike racks throughout the city. You can request one be added near your home, work or subway station by calling 311.